This is punishable by a fixed penalty notice of £30 under Section 51 and Schedule 3 of the Road Traffic Offenders Act 1988. Can Children Cycle on Pavements? Officially, no. The law on pavement use applies to all on bicycles, irrespective of age. However, children under 16 would not get prosecuted. Similar advice has been giving to police and community support officers that tickets should be given with a considerable degree of discretion, bearing in mind there is a large practical difference between a young children cycling slowly along a road to avoid a dangerous crossing, and an older person riding aggressively on pavement putting people at risk. 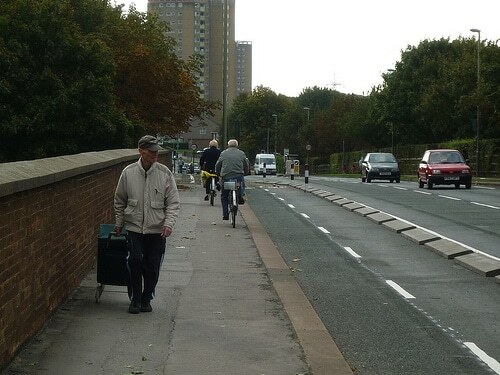 Fixed penalty notices for cycling on pavements is intended for pavements by the side of a highway. For footpaths away from roads, e.g. in parks, it is less clear an offence is being made, unless the path is clearly marked as non-cycling. As a cyclist I want to cycle on the roads not pavements. It’s that simple. (Even though roads are quite dangerous, and at times you feel like putting your life on the line). 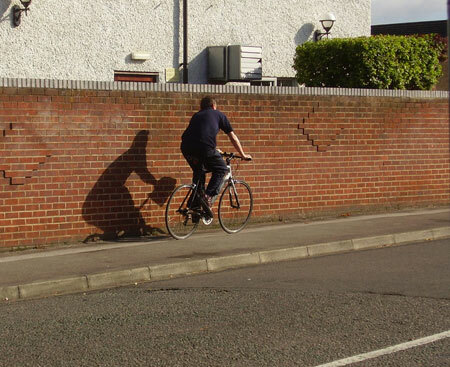 Unfortunately, people on bikes (I won’t call them proper cyclists) do sometimes ride aggressively on pavements, which can be quite off putting to other pedestrians. It can also lead to accidents. But, I’m not a ‘pavement fundamentalist’. Occasionally, I can empathise with people who ride on pavements. If necessary to get from one road to another. To miss dangerous junctions where a cyclist would be forced to take a risky crossing. When I see very young kids learning to cycle on the pavement I can understand why they are avoiding roads. However, I feel a better solution is to make roads safer, rather than avoid roads. A 20 mph speed limit in urban areas should help make roads safer. If people cycle at walking speed and are ready to give way to any pedestrian. People will see it is illegal and therefore should never be done. They have a point. But, how many cars stick to legal speed limit? There is a big difference between a young kid cycling slowly on pavement and someone riding aggressively expecting people to jump out of the way. The advice of the home Minister to enforce cycling on pavements with discretion is good common sense advice. I do see some people cycling on the pavement, with disregard for other road users, and I would like them to get a ticket. I am usually suspicious of cycle paths made out of narrow pavements. They satisfy neither pedestrians who have to share a small pavement with cyclists. Cyclists are left with the worst of both worlds. They have to be very cautious on the ‘cycle path’ because of pedestrians. 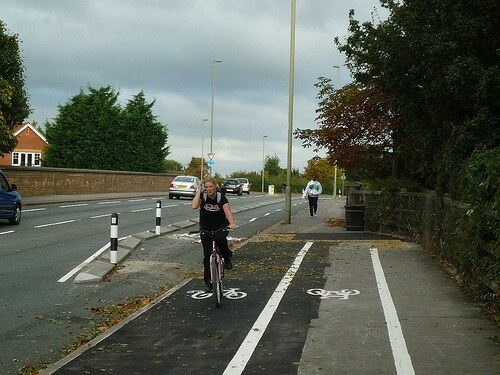 But, if they don’t use these useless ‘cycle paths’ they get criticised by motorists for being on the road. They are kind of left with a no win situation. It is this kind of cycle path that is often worse than nothing. Unless it is path on a pavement designed to avoid an awkward junction. I regularly reverse my car out of the drive. I also frequently see kids (often teenagers) cycle bikes very fast on the pavement. This is actually very dangerous. 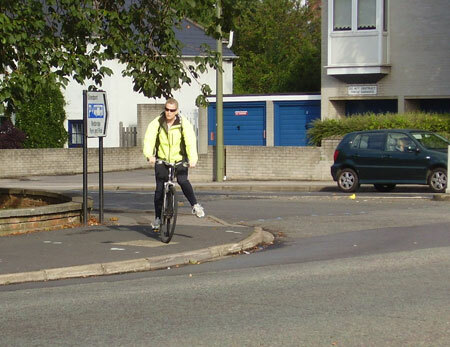 Many motorists are not expecting cyclists on the pavement, they expect people to moving at walking pace. By cycling on pavements, cyclists put themselves at greater danger from collisions. and crossing junctions. If a cyclist cycles furiously on the pavement, I can understand why pedestrians get annoyed. If they went at walking pace and were willing to give way to pedestrians then it wouldn’t be such a nuisance. Cyclists can cause injury and even death in rare cases. Many cyclists use the pavement at this junction because there is quite a long wait at the lights. However, it can’t be justified on the grounds of being safer. Here using the pavement does not help cyclists. Should it be legal to cycle on pavements? Probably not. Though, where appropriate pavements can be made shared use cycle paths. To help cyclists avoid dangers road junctions. But, perhaps designed in a way to discourage high speed – just get from place to place. Many people on bikes will abuse the law and cycle faster than is prudent. Cyclists need to fight for the right to use roads in a safe way, not be moved onto walkways and inferior cycle paths. On the other hand, there are times when the common sense thing is to use the pavement, so the law should make allowances. A cyclist travelling slowly, short distances on pavements and who gives way to pedestrians is not causing any real problems. 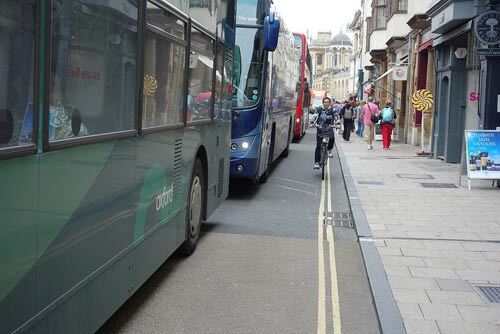 Should cyclists be fined for cycling on pavements? Cycling on the pavement, could in theory leave you with a fixed penalty charge of £30. If the police did this in Oxford, they could make a nice profit. If the cyclist is riding fast and if there is no real necessity for cycling on the pavement, Fining is a good thing. I would love to see people on bikes be more considerate and not give ‘cyclists’ a bad name. Though have you noticed when people drive a car inconsiderately, we don’t label all ‘motorists’ as bad. But, when a person on a bike rides inconsiderately all ‘cyclists’ tend to be tarred with the same brush. But, I would also love our roads to be made safer, so that people can cycle on the road without risk of being run over by careless and negligent driving. 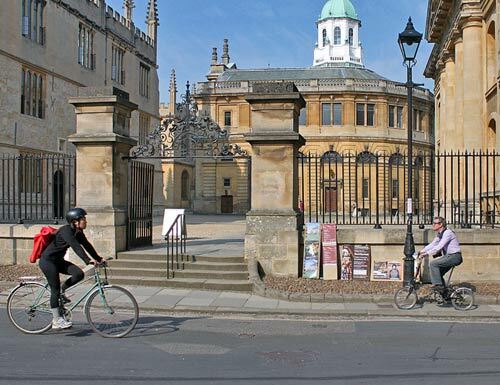 I would also like to see better road planning, so more proper cycle lanes are provided which provide safe routes for people to cycle into town. And then people design cycle-paths — in new developments — that just end in pavement without even a drop kerb exit. I got hit hard on the arm by a man riding his bike down a pavement. As he rode towards me he could see he was going to hit me but I think was too stoned to swerve. Then unbelievably he passed me the other day just as dangerously. I’d stopped to test from heavy shopping bags and he sped past. People like that should be fined. Considerate bikers I have no problem with. i have just had a confrontation with a crazy Romanian who thinks pavements are for bikes and roads are for cars . most cyclists are idiots whom take no notice of the law and want pedestrians to get out of the way as well as expecting cars to do the same…. get off the pavement and get on the road ! I know exactly where my sympathies would lie if you hit a child on a bike reversing out of your drive. This has almost happened to some kids I know (4 and 6) on their way to primary school. Should runners (or kids running) not be allowed on pavements because they’re not “moving at walking pace”? Many runners can be as fast as a kid on a bike. Are you seriously saying people shouldn’t CYCLE on pavements so they won’t be at risk when people DRIVE on the pavement? My driveway doesn’t have great visibility, and that’s why I always reverse in and drive out forwards looking carefully. As much as I’m no apologist for reckless or inconsiderate pavement cyclists, I do think people cycling on the pavement make a point which would otherwise not be made. If I want to make a journey along a certain route by bike but feel intimidated by motor traffic I have a number of options. If I “man up” and cycle anyway (in fear for my life), or if I change my route, or go by car (or bus) or if I just decide not to make the journey, then there is no obvious sign that there is a problem. People say, why do we need cycle facilities there when no-one is cycling (why put a door in that wall, no-one is going through it at the moment)? Pavement cyclists are a clear indication that people want to cycle, but the provision for them to do so legally is not acceptable to them. Even the reckless idiots can’t enjoy weaving through prams and pensioners surely? The highway code advises that people should (where they can) reverse into their drives & drive out rather than the other way round. Lets face it, roads everywhere in this country are not designed for the volume of traffic and the ever increasing width of motor vehicles. As a driver, the roads feel more & more dangerous every year- people seem less able to judge their distance with other cars let alone cyclists. As a cyclist who rides almost every day, there are still bits of roads that I choose to avoid and favour the pavement (these bits actually have almost no pedestrians & are intimidating for even a seasoned cyclist). On arterial roads there seems a real drive to combat congestion by narrowing lanes especially at junctions, making them increasingly dangerous and road narrowing to help pedestrians cross roads more safely at the detriment of the safety of cyclists. I don’t know Oxford too well, but on my last visit there I found the shared use pavement / cycle paths great, but I often wasn’t sure where they ended and when I should be on the road- I felt the shared used paths had very much muddied the waters about feeling ok to ride on all pavements – well if I can on this, why not on this? I agree that pavement cycling shows a clear need for something that is missing from our infrastructure. And yes there are idiots on bikes, like there are idiots in cars and neither should be in charge of either vehicle, but for the rest of the pavement cyclists who are curteous and just trying to get around, I think it’s completely understandable – particularly on a stretch of road where I’m in a painted on road cycle lane, I see many choosing the pavement here… because 75% of cars on here drive with two wheels in the cycle lane because the lines force the cars so close together in the middle of the road if motor vehicles do not drive in the cycle lane! With the constant volume of traffic here, it really is no wonder people choose the pavement. Incidentally, when riding on pavements I have honestly never had anything but smiles and thanks from pedestrians (for stopping or slowing to one side while they pass). The smiles may be connected to the fact I generally only cycle on pavements with my daughter(s) on the bike, and people seem very understanding and tolerant of that. This contrasts with the entitled attitude and grief you occasionally get from drivers when riding totally legally in primary position on the road. Yes, it’s funny that. I sometimes go on a pavement because there is no room for two parked cars and a car / van/ in the road. The driver is always grateful I take the common sense approach and give him space to keep driving without having to slow down! But, if you stay on the road, they can get really mad. Sometimes, it feels like you’re in between a rock and a hard place. I think there’s an interesting example of the grey area of cycling on pavements on the London road in Headington (although it is being dug up at the moment). On the north side of the road the path is shared use and there is a white line painted, which wiggles around trees and lamp posts and there is no effective merging with the road. On the south side of the road there is no painted white line although the pavement is at least as wide, it is not officially shared use. Lots of people cycle on the south side pavement, although this is illegal, the only detectable difference from the ‘legal’ north side is a painted white line. I completely understand why, a person on the south side but wanting to head east faces the danger and inconvenience of crossing over a busy road twice to remain legal, or cycling illegally on the pavement and avoiding any interaction with the busy road at all. The poor design and quality of cycling infrastructure greatly contributes to the perceived problem of pavement cycling. The issue with pavement cycling is that it makes walking an unpleasant activity. It turns a daytime stroll into much the same scenario as walking home on a Friday night with boisterous drunks around, where you have constantly to watch your back for trouble. I wonder how many people decide to take the car instead of walking short distances, if they are otherwise likely to encounter pavement cyclists? Also, the design of pushbikes is hopelessly unsuitable for mingling with foot traffic. Modern motor vehicles are required to be free from protrusions whose presence can multiply the injury to a pedestrian in a minor collision. It has been shown time and time again that this design policy saves injuries and lives. The offroader’s bullbar being of course the antithesis of this policy. Cycle designers show no such concerns for collision mitigation. If bikes are to be used in close proximity to pedestrians, then the design needs radically changing so that any collision will be a glancing soft blow from a curving surface instead of a whack from a chrome-steel handlebar with various sharp, unforgiving projections along its length. I don’t say it would be a complete answer, but even if the brake levers were faired-in, that would have prevented the nasty gash I received in last year’s encounter with a pavement cyclist, which was probably at no more than 10mph. as the uk is backwards due to its old layout tight roads and tight pavements and lots of traffic what would you prefer a young fit and healthy person getting squashed by a lorry….or a old woman who has had a good innings getting knocked over and banging her head….? A life is a life…regardless of age, and I wouldn’t see my 4 yr old boy as priority over a 80 yr old lady. Maybe this (your) kind of thinking is what needs adjustment! Ive been knocked over by a kid of about 10 who was on the pavement and accompanied by her father also on a bike. I went right over the bike, my blouse torn, my shopping all over the place and I ended up with my arm from shoulder to elbow black, literally. After picking up my shopping and handing me the bag the father and child cycled off murmuring they had only been going slowly. I was bruised and limping for weeks, had I been a decade older I could have ended up with broken bones. Bikes should NOT be ridden on the pavements or pathways – if people are not competent to ride a bike on the road then they should push them along, not ride two and three abreast and make life so frightening for so many of us who just want to take a walk. Get bikes licenced and paying insurance with clear number plates. I can see arguments for both. I used to walk to and from work but since moving further away I now choose to cycle to work. I tend to use a mixture of road and pavement where I think it is appropriate. but the past two mornings I have had abuse shouted at me by a woman how thinks I shouldn’t be riding on the pavement – the pavement in question is the width of a road, the time of day is 6am and there are no other pedestrians around. I cycle only slightly faster than walking speed so I don’t see what harm I am doing, plus the road next to the part of the pavement I am using is one way so I can’t cycle on that. however next to the path is a grass area – are we seriously saying that I can’t cycle on the massive pavement because it is “illegal”, I can’t cycle on the road because I’m going against the flow, yet I can ride of the grass 1 foot away and that would be fine? the whole thing is a joke! I would never cycle on the path if there was lots of other pedestrians on there obviously. On another note – why is it “illegal” to ride a bike on the pavement yet legal to ride a scooter or skateboard – both can go equally as fast and are just as dangerous!! I’m gonna move to Japan – everyone rides of the pavement! I am not (any longer) a cyclist – but I completely understand why children and, in some cases adults, use pavements; in places the roads are just too dangerous. I think in many cases pedestrians & bike riders can get on just fine. They do, for example, manage this very well in the Netherlands, where there seems to be a high degree of courtesy and tolerance probably because most people cycle and walk. However!! I do object to being sworn at – albeit mildly – for not getting out of the way of a cyclist illegally riding on the pavement. This is what happened as I walked home this a.m.; when I challenged the young man (13 ish I guess), he said he was on pavement because he didn’t have a helmet, which is maybe fair enough. The other thing he was adamant about was that he was allowed to ride on the footway. It was only when he had gone on his way that I realised that poor signing by the council probably made him think this. The route markers from the local park to the town centre – a graphic showing somebody on a bike- are attached to lamp posts over the foot path. Seeing that, I actually felt a bit guilty for shouting at the kid. The real point being that in the UK we seem to deal with the public realm in a completely haphazard way. Bit of a rant, I know but cyclists do need to understand the law and treat us old pedestrians with a little bit of care! Why do people get the ump with cyclist on the pavement. Just because they might have to move there dogs out of the way for 10 secs they get the raving ump which in most cases it people with dogs that get the ump. If I was cycleing on a road I would hold up 100 times more people then I would on a path. Get a grip u have to move over slightly and you get a thank you as well so get a life and stop moaning. The reason people get the “ump” is that it is dangerous. I used to cycle and I was aware that it was illegal to cycle on the pavement, so I would get off my bicycle and push it if I felt It was safer to use a length of pavement rather that a road. Now I am often a pedestrian and over the last few years I have noticed that it is becoming increasingly more dangerous to walk on pavements, due to cyclists using them. I often have been frightened by cyclists passing me extremely closely at speed. To day I also had a person cycle into me from behind and tell me it was my fault because I moved slightly to the side. At the time I was unaware that they cyclist was their as I am partially deaf and did not hear the cyclist. Although the cyclist was traveling slowly, it did frighten me. I think there is a need to make the roads safer for cyclists because a mix of pedestrians and cyclists on the path does not work. When a gentleman tells you to cycle on the road, he does so as he believes the laws should be obeyed. When a slovenly tramp swears at you for cycling on the footpath, he is a moron who who is annoyed with his sad live and he is taking it out on the cyclist. Having personally been hit by a cyclist on a pavement I believe the fine should be increased and more rigorously enforced, with the possibility of stricter sentencing for repeat offenders. Quite simply, it’s illegal, you shouldn’t do it and the police should take action against you! Right now, cyclists dont want the law changed. In practice they dont get pulled up, let alone prosecuted for taking pedestrian space. In fact, I would recommend any pavement cyclists to come and revel in the freedom of my local so called pedestrian zone where all manner of abuses go unhindered by the law. Every level of government cops out when you question them. It is never their remit to deal with this. if the law were to be altered, the upper house would no doubt expect cyclists to take some of the responsibilities other vehicle users are subject to – training, testing, safety checks, insurance, and, most onerous of all, a number plate so other people can see who they are, all of which, apparently, make cycling “unattractive”. But responsibility is like that. So, best to leave things as they are: no penalties in practice, and no responsibility in law. I’m a keen cyclist visiting the UK from the US. Was uncertain about the legality of cycling on the pavement, googled and found this site. Where I’m staying there’s a short (1/4 mile) section of a very busy and narrow road that connects a bike path with a quiet country road that is part of the local bike route system. There’s a pavement on the busy road and so far I’ve seen virtually no pedestrians use it. So my choice when cycling is to ride on the road which is barely wide enough for 2 cars putting both motorists and myself at risk, or ride slowly on the pavement and, in the unlikely event I meet a pedestrian, give him or her priority. Should I do what makes sense or what is legal? I read a lot of blogs from cyclists who continually blame motorists for “forcing” them to ride on pavements (or footways to use the legal vernacular). I can only surmise that they have never been taught that two wrongs don’t make a right. After being clipped by pavement cyclists on two occasions in the last year I decided to do a quick survey of how many cyclists I see on the road and how many on the pavement, just to satisfy my own curiosity. Now bear in mind that I travel to work at 6:45 in the morning and arrive in the city centre at 7:30 when the roads are very, very quiet. I travel back at 4:15 pm arriving home at just after 5 when things are a lot busier. Oddly enough I found less of a difference than I expected between the two times. Anyway, the crux of it is that of a total 316 cyclists I counted in the past two months 199 were on the pavement, that’s 63% (80/140, 57% in the morning and 119/176, 68% in the evening). So, to all of you who quote “most cyclists use the road” and “cyclists only use the pavement when the road is too dangerous”, think again. Maybe do your own count, it might vary vastly where you are and it would be interesting to know. At the moment it is the pedestrian who is ultimately suffering because of the selfishness and bullying of what appears to me to be quite the majority (both cyclists and motorists). Oh, and for anyone who’s interested, yes I do sometimes ride a bike – on the roads. I live on an extremely busy road, with limited pavement in a semi rural location, just recently I decided go out on my bike, having a long driveway I mounted my bike and free wheeled towards the road also accessing passing traffic, I just approached the kerb side when a passing cyclist shouted ” get of the effing pavement” how am I supposed to get on the road without been on the pavement first ? I wouldn’t mind but I’m a grandmother who just likes to walk and cycle to keep fit, and didn’t appreciate the young mans aggressive attitude. I can only imagine if he was a car driver he would be a right road rager!!! These are the ones who should be fined for abusive behaviour. Every morning I cycle to school with my daughter who i insist remains on the pavement and i go on the road for the majority of the journey. Great excercise for my daughter, which also does not cost anything.There is however a small section leading us to our pedestrianised village centre, where no cycling is permitted, that we have to go through to get to the school. I consider myself and my daughter to be very careful and mindful of other pedestrians if we have to be on the footpath or in the village. I do not trust other motorists: The majority don’t signal which is both dangerous to all and infuriating and given the number of motorists, I have witnessed as a driver, overtaking a cyclist at the most dangerous of places is unbelievable! OUR LIVES ARE NOT WORTH THE RISK! I was astonished this morning when just before we entered the village going uphill we both rang our bells, in advance to the pedestrian in front who apparently did not hear and then crossed directly in front of us as we tried to avoid her resulting in myself falling off my bike. I did say stupid women to my daughter which she oddly heard very clearly but decided to then accuse me of swearing and was down right rude and aggressive to myself and my daughter. Old or not this is uncalled for! I do completely understand older peoples fears, but the abusiveness from many older members of the public is also unacceptable. As pedestrian i am constantly avoiding dogs or many dogs on ever extending leads, this is far more of a concern to me. It is about time, like in places such as Budapest or the Netherlands more efficient infrastructure was put in place. There are too many cycling or bicycle on the pavement. Pavement is not wider enough. Bicycle round the corner was very danger turn and could hurt someone. A child? Enough is enough. That got a stop now. I ride on the pavements mainly because around my area, there are some nutters and I only ride up my road which is a one way street in the same direction. When I ride on the pavement where there is not a cyclist specific zone, I slow down and wait for them to know that I am there instead of ringing my bell and scaring them to move out of the way. I find that this is most useful for pedestrians and I haven’t hit or come close to hitting anybody due to being responsible and letting them decide when to move out of the way. If they don’t notice me at all, I still wait for them to see if I am there. To ensure that I am able to pass safely, I use approximately double my width which is the usual width of a person. If not, I don’t pass and if they can’t move out of the way further then i’ll inform them that I cannot pass so i’ll just follow them. However, there are some people who couldn’t care less for a fair policy and want to force all cyclists to use the road when there are either nutters there or i’m going the opposite way down a one way street. There is this one person who has been constantly verbally abusing me about it and I ignore him. However, once I passed him, he wanted me to stop and grabbed my arm so I couldn’t brake so I just shook him off because I had not a lot of stability and was unable to brake. Just to inform you, this is the opposite way down a 1 way street which means that there would be a high likelihood that there is a car coming my way. To ensure my safety for the bottom half where my house is, I operate the same philosophy as I did before on pavements because my house is on the right and I don’t really want to go to the right side where there is likely to be a car coming in the opposite direction. I only use the pavements near my area because I feel unsafe on the roads and don’t want to risk at least my life due to making a mistake. Fortunately, for the most part there is either a ‘cycle path.’ (One mixed with a pavement.) Or a park based area where some council cars drive on anyway. i was walking down the street and an idiot on cycle had his dog on a chain which gnarled my shin, now bleeding. I said to get on the road and he said “what with a dog?” so i said “walk then”. He got back on his bike and cycle off up the path shouting. I was close to smashing his face in, I am furious. motor vehicles due to the bad treatment drivers receive. these side roads in a type of death wish manner because they neither slowed looked or showed any sign that could stop if a vehicle was in their path. There have been incidents for years whereby pedestrians have been hit as well as cars run into and cyclists that have not hit cars were seen to go over the handle bars. Many ride hands free as if they’ve just won the T De France ! car drivers who cannot see them when the driver however careful starts off from the give way lines only to be run into by a cyclist that is travelling at an inappropriate speed. This is anti car anti cyclist /pedestrian road safety on behalf of political ideology. The above comment as posted poses further questions. If the cyclist contravenes the requirements of the controlling traffic light signals by following this this practice then surely two offences are being committed? An act is definitely law.